This download-only release from National Treasure Billy Jenkins, renowned punk blues guitarist and satirist, follows his 2015 album Death, Ritual & Resonation. That fantastically well-reviewed album was for solo “low strung guitar”. Ghost Music is created as background music – like distant wind chimes…. But it comes towards you, the ear drawing in, becoming mid-field music…. And then, as one starts to appreciate the overtones, ambient noises, and piano mechanics, it ends up as near-field music. The music is difficult to describe. It reminded me in places of Messiaen – strangely austere with very odd cadences. Occasionally melodic lines emerge from a contemplative set of predominantly minimal improvisations. This being Billy Jenkins there is some light heartedness, for example in Selfless Selfies where he references Three Blind Mice. 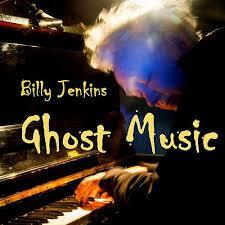 Towards the end of the album the music becomes fuller as Jenkins employs more chords and dissonance. Self Lived Lives is a particularly poignant piece. I found the final rather bleak Humanless World with its scraps of We’ll Meet Again the most interesting of all – the melody breaks off, to be overtaken by a strange Morse code-like finish. In fact, according to the press release, there is a hidden Morse code message in each tune which, unfortunately, I cannot decode. It seems unlikely we will be able to enjoy a performance of this music. Jenkins stepped back from the music scene in the early 2000s, and worked as a humanist celebrant for seven years. He has not played in public that much since. He did perform at the London Jazz Festival in 2010 with the BBC Big Band playing rearrangements of his music by Voice of God Collective stalwart saxophonist Iain Ballamy. Jenkins is still composing and recording, but a combination of ill-health and over-sensitivity to sound has restricted his travelling and performing. He is “currently on an open ended sabbatical from live performance”, which, for those of us who have witnessed his astonishing performances over the years, is a blow. It is difficult to imagine who might be the intended audience for this new collection of mysterious piano reveries, so different from Jenkins’ raucous and hilarious blues and jazz adventures. Perhaps he will discover a new following among New Art Music aficionados. Let’s hope so. All music composed and played by Billy Jenkins on piano, with a guest appearance from a purring studio cat on track one.